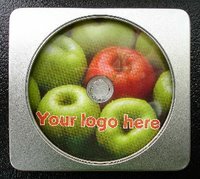 We've sourced 2 great new cases for your discs - hinged metal tins with a clear window in the front to show-off your disc. Ideal when you need something a little bit different, these come in 2 sizes, approximating to jewel-case size and DVD-case size. The CD-style case has a plastic insert to protect the disc and this insert allows for up to 4 discs to be 'stacked' in one case if required. The DVD-style case also has a plastic insert - this case can hold paper parts underneath if required and allows for up to 3 discs to be 'stacked' if required.